The map's title appears in English and Dutch in a panel along the top. 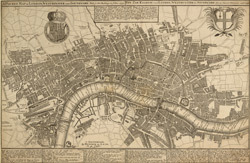 A descriptive note features below the title, with royal arms at top left, city arms at top right and fares of hackney coaches and water ferries in a panel below the plan. The map shows the new bridge at Westminster and represents prominent buildings and landmark three-dimensionally.